A homeowner asked about touch-up painting for trim and kitchen cabinets – this explanation really clicked for her. When a chip happens there’s really no easy way to make that nail look like all the rest, is there? She had no more questions. 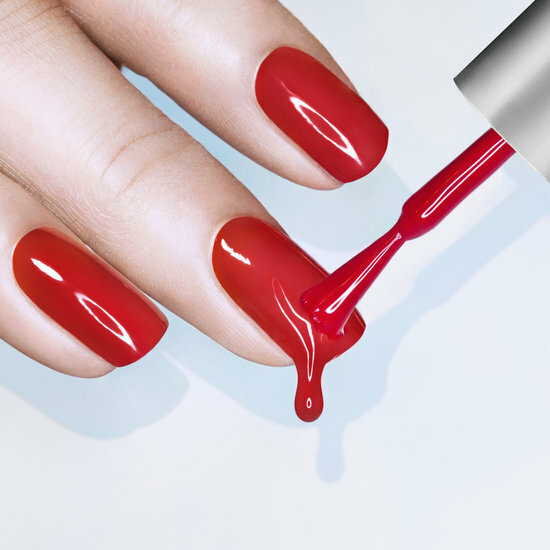 You’ll notice how similar nail polish lingo is to painting lingo. 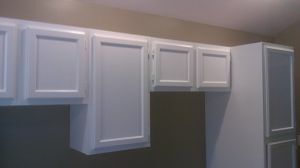 Same process, really – primer, paint and, in the case of kitchen cabinets, very often a clear coat on top of everything. Sure, you can apply paint to cover a chip, but it won’t look the same without a lot of extra work. Now, if you’re selling a house that might be OK – but keep this trick in mind when you’re buying, too. What at first appears to be a well-painted home may really be nothing more than clever touch-up work. That’s something that you’re likely to not see until you’ve lived in the house for a bit. 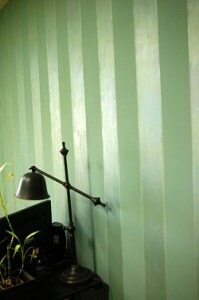 If you’ve got touch up painting questions, give us a call. We’re happy to help and there’s usually no chipped nails in answering questions. Updated Golden Oak – this young couple was delighted with the transformation. Material – there are trade-offs. Solvent-based (oil) materials have some advantages, but they have terrible odor. Not just your average terrible, but industrial strength, move out-of-your-house-for-three-days kind of terrible. A latex product solves the odor issue and the right product will solve the durability issue. Application – there are some DIY kits available that say the product can be brushed on, but most professionals wouldn’t even think of brushing kitchen cabinets. Cabinets require a silky-smooth, even layer of paint – the kind of finish that can only be achieved with a sprayer, a practiced hand and a keen eye. 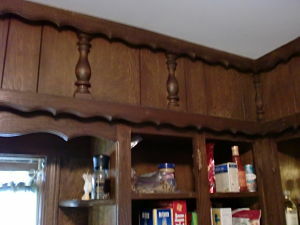 A close view of dated, dark and dingy cabinetry before painting. The previous homeowner was a heavy smoker – major cleaning was required. Durability – This is a balance between finish hardness, flexibility and adhesion. Too hard and the finish will chip under the heavy use common to kitchens. Poor adhesion means it’s even more likely to chip because it doesn’t stick very well. Flexibility means the finish has more “give” when dinged but at a certain point adhesion comes into question. Proper material selection is critical – you don’t want to learn six months later that there was a better choice available. Blocking – A finish with good blocking properties will allow you to put a can of soup on the shelf and remove it a month later without leaving an impression or removing paint. Latex products have typically not had very good blocking properties, but there are niche materials available that block as well as oil-based paints. Hardware – there’s no problem to replace existing hinges or door pulls provided the hole spacing is the same. If there are holes to fill (say you change from a door pull to a knob), you might consider texture. The hole will be filled and then sanded smooth; that repair will not match the texture of the surrounding wood. Usually not a deal-breaker, but a small detail that might affect your expectations. 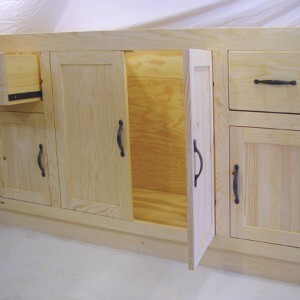 Interiors – Melamine cabinet interiors are almost always masked to protect from paint; wood or composite materials are often painted, depending on age, condition and homeowner preference. Masking takes more time to make sure that paint goes only where it should. Grain-filling – Oak is considered an open grain wood and maple is a closed grain (and therefore very smooth) wood; other species may have knots. If the texture of open grain or knotty wood doesn’t appeal to you the grain can be filled and sanded for a smoother appearance. This option involves a bit more time but it’s a practical way to minimize wood texture. A caution, though – it’s reasonable to expect a “disguise” of the wood grain rather than a complete conversion to piano-smooth. 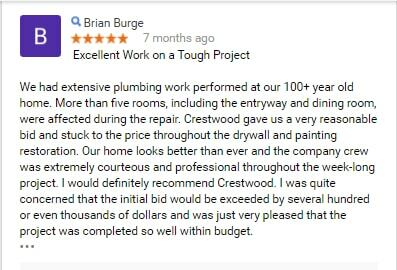 If you’d like to discuss the options available for your kitchen cabinets or bathroom vanity, please call Crestwood Painting today! Sheen describes the amount of light reflected. Everybody knows about color; not many know about sheen. But it is just as important when choosing paints. So here we go! Sheen is another way to say “light reflectance”. Kitchen cabinets are usually higher-gloss surfaces and so reflect more light that most ceilings (flat sheen). One is not better than the other – but there are trade-offs and considerations in choosing which sheen is best for a particular application.